African American women of all backgrounds—including Garner and Williams—share experiences of racial and gender discrimination. A growing body of research suggests that stress induced by this discrimination plays a significant role in maternal and infant mortality.8 This issue brief synthesizes research explaining the racial disparities in maternal and infant mortality rates and articulates how institutional racism contributes to both. It reviews empirical literature on maternal and infant mortality, concluding that the greater prevalence of maternal health risk factors among African American women cannot account entirely for their higher mortality rates. Instead, the impacts of institutional racism and sexism compromise women’s health across time, leading to poorer outcomes for African American women and infants.9 A fractured and unequal health care system and gaps in health workforce training further aggravate these racial disparities. It is racism, not race itself, that threatens the lives of African American women and infants. Protecting the health of mothers and infants is a critical measure of a country’s development. By most accounts, however, the United States holds the worst records for maternal and infant mortality in the developed world. 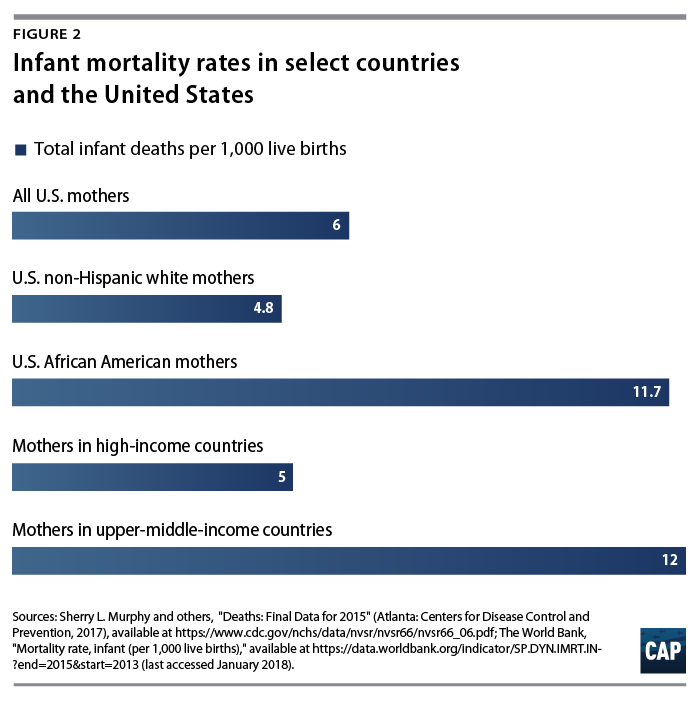 (see text box) Women in the United States are two to three times more likely to die than Canadian women in the maternal period—from the start of pregnancy to one year after delivery or termination.10 Similarly, infants in the United States have a 76 percent higher risk of death compared with infants in other wealthy nations.11 Disaggregating data by race reveals that higher rates of maternal and infant death among African American women drive the United States’ mortality crisis. 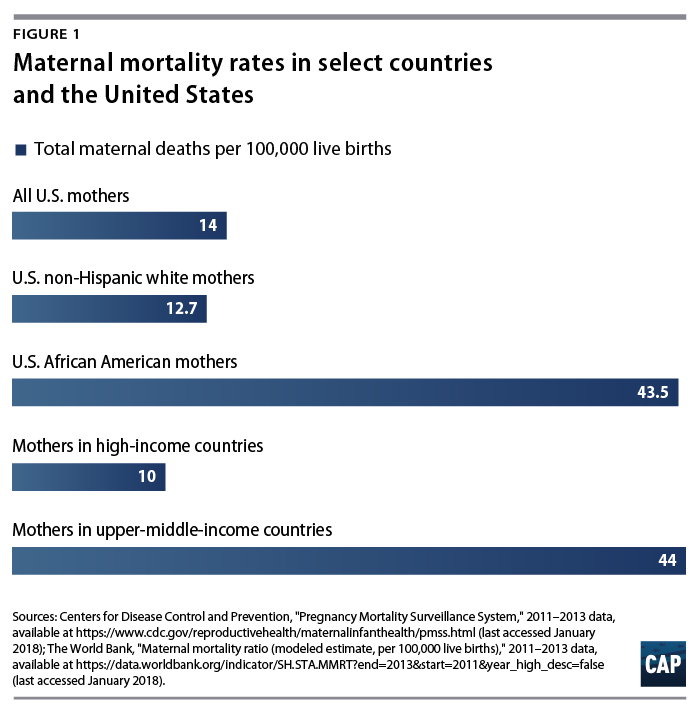 Most research on health disparities in maternal and infant mortality focus on African American women’s greater exposure to risk factors around the time of pregnancy, including poverty and low socioeconomic status; limited access to prenatal care; and poor physical and mental health.20 Although African American women are more likely than non-Hispanic white women to experience these interrelated risk factors, research shows that this greater likelihood does not fully account for the racial gap in outcomes; rather, these disparities stem from racial and gender discrimination over the life span of these women. This may partly be due to differing quality of prenatal care. Studies show that once African American women access prenatal care, it tends to be of lower quality and the women experience more complications. Current health status, health history, stress, and experiences of racism may contribute to maternal and infant mortality when coupled with lower-quality prenatal care. Obesity—which is associated with pregnancy complications such as preeclampsia29—predicts both maternal and infant mortality and is more prevalent among African American women.30 Yet a recent study from the New York City Department of Health and Mental Hygiene showed that African American women of normal weight were still at higher risk of dying in the perinatal period than non-African American obese women.31 A related study comparing infant mortality rates of obese African American and non-Hispanic white mothers showed that non-Hispanic white women experienced uniformly lower risk.32 Thus, higher rates of obesity among African American women do not explain the racial disparity in infant or maternal mortality. 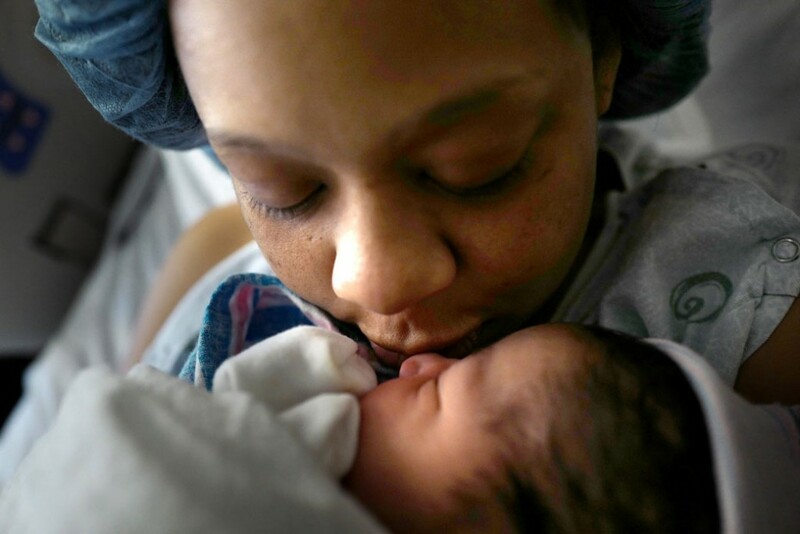 While differences in maternal mental health may not be enough to explain the gap in birth outcomes between African American women and non-Hispanic white women, they should not be ignored. In order to address trends in adverse experiences during pregnancy and the postpartum period, policymakers should consider African American women’s lack of access to appropriate mental health care screening and services as well as the link between increased stress and maternal mental health. Research that views maternal risk factors as explanations for racial disparities in maternal and infant mortality often narrowly focuses on women’s health during pregnancy. But this approach overlooks an important truth: Healthy, full-term pregnancies and safe labor are more likely to happen when women are physically and mentally healthy before becoming pregnant. Taken together, these examples show that social and economic forces can profoundly affect African American women’s development across the life span. Lu and Halfon’s alternative model, known as the life course perspective, rests on two mechanisms backed by empirical evidence to acknowledge these forces: the early programming model and the cumulative pathway model. The early programming model proposes that exposure to risk during sensitive developmental periods in early life can affect women’s health later. For example, research links maternal depression and anxiety during pregnancy to a higher risk of obesity and diabetes among offspring.46 Obesity and diabetes are well-known maternal risk factors that threaten the lives of pregnant women and their infants. In other words, the seeds of some risks are sown before a woman is even born. In contrast to the early programming model, the cumulative pathway model focuses on stress across time, positing that chronic exposure to stress leads to allostatic load, or greater wear and tear on the body’s adaptive systems. Controlling for socioeconomic status, researchers found that African American women had the highest allostatic load scores in a sample of non-Hispanic white and African American men and women.47 This finding is also supported by other research showing that the health of African American women deteriorates more rapidly than that of non-Hispanic white women during the reproductive years.48 During pregnancy, chronically elevated levels of the stress hormone cortisol lead to immune suppression, increasing women’s risk of perinatal infections and leading to life-threatening pregnancy complications. This means that even if African American and non-Hispanic white women report similar levels of stress during their pregnancies, African American women’s increased exposure to stress throughout their lifetimes increases their allostatic load, which increases their risk of maternal and infant mortality. Given the United States’ climate of racial inequality, African American women are more likely to experience stress during sensitive periods in early life and to be chronically exposed to stress. One would therefore expect women spared the stresses of American racial inequality during sensitive early developmental periods to have better outcomes. This seems to be the case, as black immigrant women—mostly from African and Caribbean countries—who arrived in the United States as adults enjoy better birth outcomes than native-born African American women.49 Similarly, one would also expect better birth outcomes for younger African American women, as they have spent less time exposed to the cumulative stresses of being a person of color in the United States. Indeed, studies show that African American teen mothers have lower infant mortality rates than African American mothers in their twenties.50 Since the births of young mothers are generally associated with poor health outcomes,51 this is a surprising finding and has been taken as strong evidence for the weathering52 hypothesis—the idea that cumulative stress negatively affects African American women’s health. Conduct research that substantiates the connections between a mother’s health before, during, and between pregnancies as well as that of her child across the life course. Conduct comprehensive, nationwide data collection on maternal deaths and complications—with data disaggregated by race, geography, and socioeconomic status. Produce data sets that include information on social and environmental risk factors for women and infants of color. Conduct better assessments and analysis on the impact of overt and covert racism on toxic stress and pregnancy-related outcomes for women and infants of color. Conduct research to identify best practices and effective interventions for improving the quality and safety of maternity care. Conduct research to identify best practices and effective interventions, as well as health outcomes before and during pregnancy, in order to address predisease pathways of adverse maternal and infant health. Conduct research to identify effective interventions for addressing social determinants of health disparities in maternal and infant health outcomes. Federal policies such as the Maternal Health Accountability Act of 2017 can support state and tribal efforts to collect some of these data,68 but data collection alone is insufficient. Supporting research that aims to better understand maternal risk factors—much like the Mom’s Opportunity to Access Health, Education, Research, and Support for Postpartum Depression Act—will be important for future policy efforts.69 Furthermore, centering the lived experiences of African American women and the effects of those experiences on pregnancy-related outcomes are essential in order to fill gaps in research and develop sustainable policy and program solutions that help curb disparities in maternal and infant mortality. Although recent attention on cases such as those of Erica Garner and Serena Williams shed light on an important problem, real change will require greater knowledge of why African American women and infants are most likely to die as the result of pregnancy-related complications. Greater political will is also essential to undoing the legacy of racism in the United States, which is a contributing factor in maternal and infant mortality among African Americans. Racism’s harmful effects must be dissected to adequately address racial disparities in infant and maternal health. And once racism is taken into account, public policy and program solutions must be developed to dismantle it—spurring a lasting impact on health outcomes. The lives of African American women and infants depend on it. Cristina Novoa is a policy analyst for Early Childhood at the Center for American Progress. Jamila Taylor is a senior fellow at the Center.